Gearbox wasn't done supporting Borderlands after releasing The Zombie Island of Dr. Ned; a second DLC pack is already on the way. The coming of a new Borderlands DLC expansion has been officially announced and it looks to add a new game mode and a few extra bonuses. 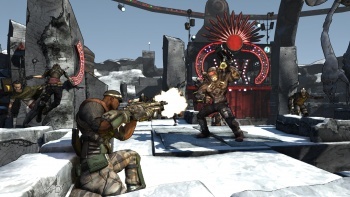 The expansion will be called Mad Moxxi's Underdome Riot, a title that was obviously inspired by the film Mad Max: Beyond Thunderdome. In Thunderdome, Mad Max must fight in a gladiatorial arena where "two men enter, one man leaves." Presumably, this is also the premise of Mad Moxxi's Underdome Riot, but with four people entering and hopefully four leaving. The expansion will add three new Riot Mode arenas that task groups of players to survive against waves of enemies. Unlike Mad Max, players of Underdome Riot will be collecting lots and lots of loot in the process of fighting in these arenas. Mad Moxxi's Underdome Riot will also add a bank in which weapons can be stored; not a bad idea at all considering Borderlands is hyped for having millions and millions of weapons. Finally, Mad Moxxi's Underdome Riot will make two additional skill points available as quest rewards, enabling players to make their characters a smidgen or two more powerful. It'll cost a smooth $9.99 or 800 Microsoft points depending on which currency you choose to deal in, and is scheduled for release on Xbox live on December 29, 2009, while it's coming a little later to the PlayStation Network on January 7, 2010.